Each night you need to decide where to stay. With a campervan you have different options which can include a caravan park (trailer park), a national park, or even a free stay. For a full overview of staying in national parks please read our National Parks information. Stopping in a caravan park gives you access to other facilities such as toilets and showers, camp ovens, laundries, barbeques and kiosks or shops that will make your holiday more comfortable and safe. While there are a lot of caravan parks out there, many can be stayed at without booking, but some do fill up, and in particular at peak times. Book ahead for caravan parks you definitely want to stay in. Caravan parks often have some of the most scenic and best spots to stay. Campervans have dual battery systems, one for starting the campervan, one for the internal appliances such as lights, fridge and water pump. These batteries will last approximately 12 hours when fully charged. Therefore it is possible to stay overnight without power or water facilities. These free stays are handy to throw into travel as they can save you a bit of money. Each state has different rules on camping by the road side. Discovery Campervans has compiled a list of over 330 Free Stay locations Australia Wide. 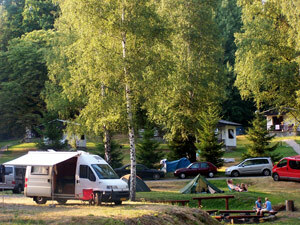 This list we make available to those who book their campervan rental with us.